Over the weekend my mom and I hosted a beach themed bridal shower for my sister. Naturally I had to bake something for it. Honestly these cupcakes are so easy, they probably don't need their own blog post. But I was just too dang proud of them that I had to share. We were in a bit of a time crunch, so I just used boxed cake mix and didn't fuss over it. I did however make my own buttercream frosting and dyed it the darkest shade of blue my food coloring would allow. We applied a thin layer of frosting and the cupcakes were ready to be decorated. I used about three or four graham cracker pieces and smashed them into sand-like bits in a small ziplock bag. When sprinkling, make sure you pat the graham cracker sand into the frosting or most of it will fall off if you happen to tilt the cupcake. Seriously pack it on so it looks like sand. 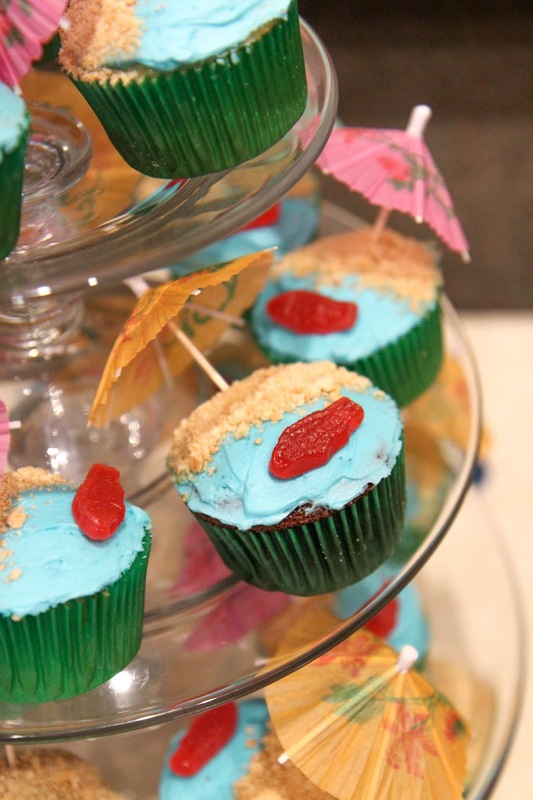 The hardest part about these cupcakes was finding small enough Swedish Fish. A regular bag of them is just too big so luckily I found a couple fun-sized bags at the party store while we were gathering other supplies. 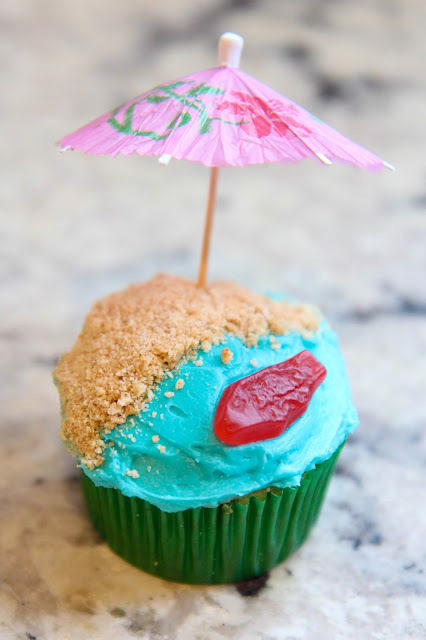 Pop one into the ocean and throw on a little umbrella and these babies are done.